Roo Dental is a Dental Practice on the Sunshine Coast providing a caring, family friendly and professional environment for patients. We aim to make the dental experience as relaxing as possible so that your appointments cause the minimal disruption to daily life. We understand that quality dental care is essential to maintaining overall health but that there are also many other priorities which demand your attention, energy and focus. Our location has been carefully selected and we are fortunate to be able to offer a magnificent view of Lake Kawana from our treatment rooms. The traditional “white box” experience of the dental, medical and hospital setting is what we have become used to over our lifetime. However, this can automatically condition us to associate all our previous experiences just by entering the same “white box” every visit. Roo Dental offers floor to ceiling windows allowing in the natural light and calming effect of the surrounding environment. Providing general dental services to ensure your mouth and teeth are in the best possible condition. Whether simple treatments such as an exam and clean or complex treatments such as crowns and bridges, due diligence is taken to give you an optimum outcome. As part of your treatment we will endeavour to give you all the relevant information and reasoning so that you can make an informed decision about what may be best for your situation. We aim to provide a friendly service when making appointments, explaining your proposed treatment plan and dealing with health fund claims. With direct claiming from your health fund you will save time and effort by avoiding having to try and lodge a claim online or in person. We hope to provide you a high level of service from our reception even before you enter a treatment room. Our dedicated kids play area is designed to entertain children so hopefully they can feel more relaxed about visiting our practice. Parents will also feel less stress while sitting in the waiting room as kids won’t be complaining due to boredom. There are toys to play with, an android tablet and a Nintendo Wii – even adults will be tempted to sit and play. Dr Ruark (Roo) Williams has been working as a General Dentist on the Sunshine Coast for the last 7yrs, graduating from the University of Western Australia in 2002 (Perth, WA). Moving to Caloundra on the Sunshine Coast in March 2009 and entering practice in Caloundra. 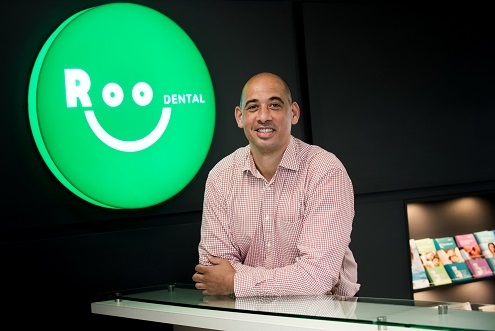 Dr Roo has now moved to open a new practice and is the Principal Dentist for Roo Dental. Offering a complete range of general dental services to suit your needs. Providing the same high level of service with a focus on patient care and providing the best health outcomes for all age groups. Also, maintaining the same close professional relationship with the Sunshine Coast’s Dental Specialists to refer patients with complex diagnoses. As part of providing your dental care Dr Roo enjoys keeping up-to-date with current and new innovations and techniques in dentistry. Examples include; the increasing use of clear aligners for minor corrections of the position of teeth and dental implant surgery to replace missing teeth. Dr Roo is proud of the fact that he is a member of the Australian Dental Association; and only works closely with dental laboratories local to the Sunshine Coast when providing your dentures, crowns, bridges etc. Together with these laboratories Dr Roo can ensure the material quality is maintained and all items are Australian made. Emergency and after hours appointments available. Roo Dental is a family-friendly dental practice located on the Sunshine Coast. We offer exceptional customer care and a complete range of dental services from our offices overlooking Lake Kawana. Emergency and after hours appointments available, call 07 5405 3653.